Product prices and availability are accurate as of 2019-04-24 07:12:01 EDT and are subject to change. Any price and availability information displayed on http://www.amazon.com/ at the time of purchase will apply to the purchase of this product. This fun and challenging 1000+ piece jigsaw puzzle contains unique interlocking pieces made from recycled cardboard and soy based inks (no lead). 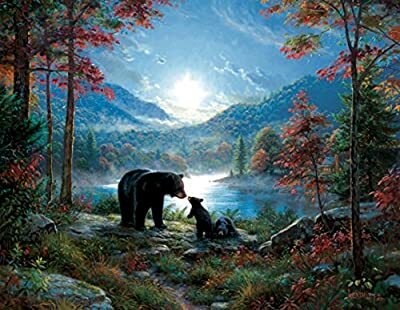 This puzzle, entitled "Bedtime Kisses" by artist Mark Keathley, is proudly made in the USA. Finished Size: 27" x 35"